Click here to read this in magazine format in Benchmark Middle East. In life it’s the friends who really don’t change that much, writes Scott Armstrong, who remain true to themselves who stay with you throughout the journey. Sure their appearance might change, they’ll age, their perspectives and politics might radically alter, but ultimately the things that make them ‘them’, the qualities that first draw you to their friendship, remain intact. This innate trust and bond is something brands in all industries have tried to emulate to keep their relationships alive with customers. Some succeed in the short term but only a special few manage to stay the long course, core values can be difficult to retain through strategic reviews and management changes. Among those handful is Dubai’s One & Only Royal Mirage. This luxury resort holds one of the emirate’s prime locations on Jumeirah Beach gazing out on the Palm Jumeirah. Like many of its contemporaries it possesses a private beach, a beautiful azure blue pool complex and lush palms creating an oasis-like feel. As you would expect from a five-star it has a collection of fine dining restaurants, a spa, and of course sumptuously designed rooms. But a quick look at their website would check off all these requirements, so what separates the One & Only Royal Mirage from a very good looking crowd in Dubai? Perhaps the clue is in the name, the One & Only. At first blush you might think they are referring to themselves but in fact a stay at the resort will convince that they mean you, as the service is geared to make each guest feel like the ‘one & only’ priority to the hotel. This distinctive service is something that has remained central to the ethos of this stunning resort since day one, some 16 years ago. There have been overhauls, new openings and refurbishments along the way, but that trusted, reliable sense of ‘you know exactly what standard you’ll get’ is firmly in place. Of course this is as it should be, but any frequent traveler to Dubai will have a litany of tales about how previous favourites, who also once excelled, had fallen by the way side, causing deep disappointment when service levels dropped. Time and again properties cut corners on the personal service trying to rely solely on their looks, but time and again they fail to learn that five-star means a top class ‘experience’ rather than simply ‘bling and breakfast’. Thankfully, One & Only Royal Mirage is one of the precious few which bucks this trend. This property was one of the first to indulge in the Arabesque theme, but throughout from lobby to lounge, restaurants to rooms, it does not go over the top. There is a muted elegance about the décor, with the gorgeous swirls, and deep fabrics, but the colours don’t cross the line into garish, and gold is used to complement rather than conquer the senses. This calm demeanor is reflected in the staff, who are assured, courteous and competent, rather than stuffy fellows encountered at other resorts whose sole training seems to run to ‘look down on the guests’. Picking the mid-range room on offer in The Palace section of the resort, a Superior Gold Club room echoes the understated luxury throughout the resort. Beiges, browns and golds intertwine in the décor with deep carpets underfoot, fine thread count linens on the kingsize bed, all with that Arabic twist including intricate lights hanging from the ceiling. The mix of light and dark creates an intimate and yet not claustrophobic home for the night. The patio opening up onto the balcony with pool and sea view opens the room up to even more light. As you might expect the room comes with access to the Gold Club, which hosts a more private venue for breakfast, lunch and a generous cocktail hour, which bubbles with conviviality as the guests mingle to share stories of their days’ experience. While you have your pick of restaurants, the Moroccan restaurant Tangine is a jewel of a find. Dark and intimate, with intricately carved wood, the interior set a distinctly North African tone. Here you’ll find authentic Moroccan fare with a host of dishes, some sweet, some savoury. Of it all the Mechoui, the roasted lamb shoulder served with saffron rice, is possibly one of the most memorable meat dishes on offer in Dubai, with the flesh crumbling away. The strong flavours combined with the tenderness of the meat make the diner sit up and take notice (the Tagine Djaj Bi Zaytoon, braised chicken served with preserved lemon and green olives, also deserved attention). If you want something a little lighter, or you simply want to hang out, the Jetty Lounge, is one of emirate’s coolest spots. 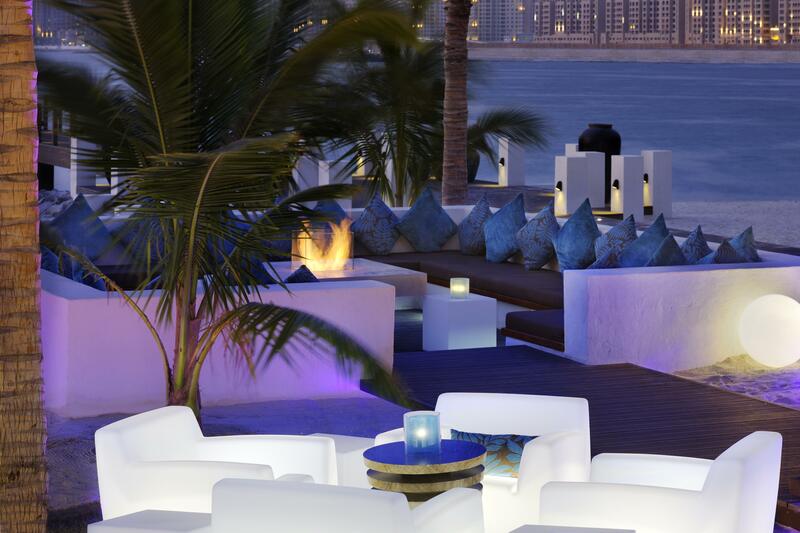 Its outdoor lounge is open to the sky and looks across the bay at Dubai, with the city and the night providing the only chic lighting required, while music and beautiful people mix creating an atmosphere of easy elegance. It’s this relaxed refinement that defines a stay at the One & Only Royal Mirage, in a city obsessed with bling it focuses on bliss. No more so than at its Spa, featuring an Oriental Hamman with separate men’s and ladies’ hours, the ideal way to shake a little of life’s hectic pressures off. In total there is 2,000 sq m of relaxation, health and fitness on offer within the spa, but chances are after one of the treatment you’ll be too chilled to try it all. When you finally come to check out of the One & Only Royal Mirage in Dubai you’ll do so happy that after so many other disappointments, at least one friend has remained true.